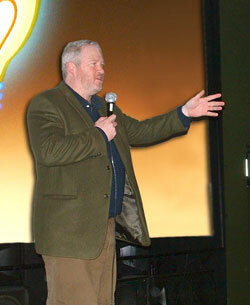 On February 28th, Seattle Mayor Mike McGinn co-hosted a benefit screening of Inlaws & Outlaws at Central Cinema in Seattle. The event raised over $7,500 for the Hearts + Minds Campaign - ensuring that the film will continue to help create change by partnering with community organizations across Washington and the nation. Mayor McGinn spoke passionately about the central role that both citizen activism and the arts plays in Seattle life. He and his wife Peggy Lynch afterwards gave the film a big thumbs up! Co-host JJ McKay then joined director Drew Emery in emceeing a non-auction where participants pledged contributions and earned chances to win prizes. Galerias Restaurant on Capitol Hill and Geraldine's Counter of Columbia City were among those contributing prizes. The Grand Prize -- a private screening of the film for 50, including the director and champagne - was won by Buster Edwards and Joe Madsen. Among participants in the festivities were Col. Grethe Cammermeyer (Ret.) and some of the film's star subjects, Tammy Snow & Dayna Tolman, Frank Chaffee & John Gliessman, and Pete-e Petersen & Jane Abbot Lighty. Two lucky audience members walked home with a jar each of Pete-e and Jane's homemade jam. Approximate value: priceless. A big thank you to all of the event's co-hosts and volunteers Nadja & David Witherbee, April Quint and Natalie Michael!